Fantastic! Horseshoe Bay ... from our anchor spot looking towards the village. The sail from Cape Bowling Green - that weird ocean "lake" - to Magnetic Island was a mixture of many things ... all pleasant! The wind was minimal and the Captain insisted on hoisting the MPS (spinnaker like sail) for the whole trip. 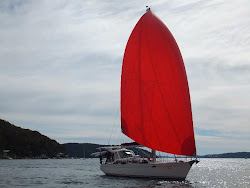 We travelled the 8 hour distance at a boat speed of about 4 knots under the big red sail. That's slow but on such a beautiful sun drenched day it was lovely for the most part and with no wind to whip up waves the boat didn't roll either. I actually could read my book underway without feeling like heaving over the side! The big red MPS sail with Cape Cleveland in the distance. As we were approaching Cape Cleveland - the next headland before Magnetic Island - we saw 3 humpback whales playing about half a mile off our port side. The water was so flat that you could see them surface and blow and slap their pectoral fins on the water. We had the pleasure of watching them from our barely moving boat .. the wind had really dropped and we were just barely moving through the water. In fact I don't think I've ever seen the ocean as flat and calm as it was then. Our experience was good with these leviathans but Ian and Sharon on Bogart had a different experience with them. On their passage later that same afternoon a group of whales in the same spot decided to give them a fright when all 3 (maybe 4 I can't remember the exact number they said) came at their yacht broadside swimming fast only to duck under the keel at the last minute. It was great hearing the story from them last night but it would have been frightening at the time. My favourite part of their story was Sharon telling us, "I was happily taking pictures of the whales playing but as they came straight for the boat I had to stop taking pics and hold on!" The rocky terrain of Magnetic Island. The Captain finally succumbed to my pleas to start the engine and move a bit faster to our final destination of Horseshoe Bay on the northern side of Magnetic Island. Neither one of us had ever been to this Island and, in fact, we hadn't heard anything about it or completed any research. We were just expecting it to be like the other islands we had encountered through the Whitsunday group. On approach it certainly looked a lot different ... gone were the green lofty hills and mountains of the others. As we approached the south-western side we saw a lower rocky landscape with many large boulders. The view was impressive. Then as we rounded the corner to Horseshoe Bay we saw a large beach with a good number of boats at anchor and a township. Graham and Leanne's yacht 'Echo Beach' was anchored off the beach so we pulled up behind it, dropped our anchor and got ready to go ashore and explore. What a surprise to find a bustling little village with a terrific vibe at the edge of the water! We dragged the dingy up the sand and walked from one end of the street to the other. Jae - my BFF in Atlanta - you would LOVE this place. Even the Captain said that. It's sort of a combination of Tulum Mexico tropical laid back and Virgina Highland neighbourhood cool. The kind of place you immediately feel at home in! We met the crew of 'Echo Beach' at the pub sitting out on the front sidewalk having a beer and joined them. I Love this place! The gang together again at Noodies Mexican restaurant before the pitchers of Margaritas kicked in. And laughed ... with Rob and Ian joining in. Eventually all the other patrons left the restaurant - we were pretty loud - and we had our dinner. The Captain and I hadn't expected to stay out late and we hadn't left any lights on the boat. Luckily Graham and Leanne had and they had the foresight to bring a flashlight as well - it gets really dark when the sun goes down and you're out in the ocean! So - after long goodbyes on the shore - G & L led the way back to the boats via our dingys. Good times and we've only been here 2 days! We don't have to be in Cairns for awhile and this is such a great place we'll hang around and explore the area. There are a lot of National Park bush walks here and we're only a 10 minute ferry ride to the regional city of Townsville. It looks like if the food was a bit shy of Good Mexican, they had mastered the Margarita Pitcher! Why are these the Magnetic Islands? Some anomalies, like the Bermuda Triangle?